Hello Inyo Fans and pool owners, we have a special treat in store for you this pool season. Matt and Rob are unveiling Inyo’s Pool Equipment Selection Series where we show you the correct way to size your pool equipment. 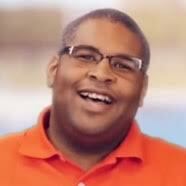 The guys will guide you through how to select the right pool pump, filter, heater, sanitizers, lights, and MORE. Along with sizing, we’ll also explain and demonstrate how parts of your system work. Read the article below the video, for extra information and links. The process of selecting pool equipment should start with the pool pump. It’s the “heart” of the pool system after all. The pump is what circulates the water to and from the pool. There are two main components to the pump; the motor and the pump housing (what’s the difference.) This is the intake and this is the discharge.There are several variables that go into determining which pool pump is needed. These variables include gallons, turnover rate & total dynamic head. A real example will help us moving forward. Let’s say the pool is a rectangle that’s 16’ wide and 32’ long. The deep end is 8’ and the shallow end is 4’. To get the average depth, add the deep end and shallow end depths and divide that total by 2. This gives us a 6’ average depth. 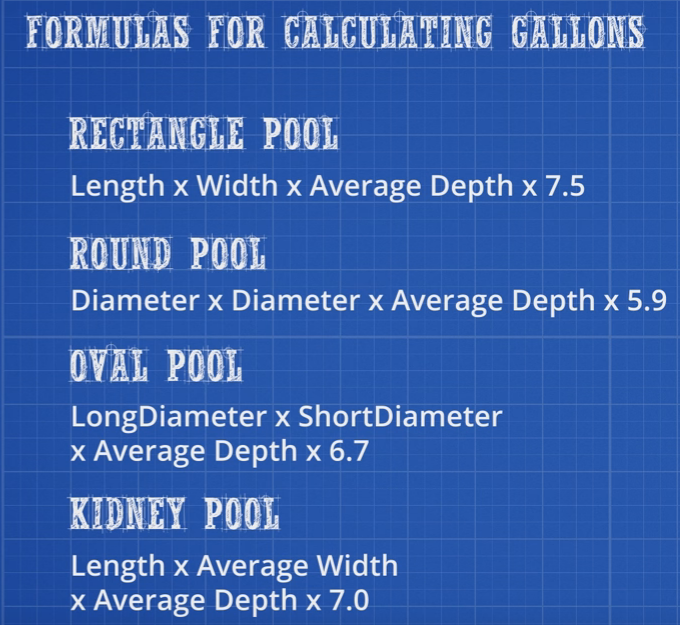 Now let’s plug those numbers in and calculate our gallons. 32’ long x 16’ wide x 6’ average depth x 7.5 equals 23,040 gallons. The goal of any residential pool is to turn over the body of water once a day. The time it takes to turn the water over is known as the turnover rate. A standard turnover time is 8-10 hours. We will use 8 hours for our example. Once you know the gallons and turnover rate, you can calculate the gallons per minute required to accomplish desired turnover rate. Next, we will determine Total Dynamic Head of your plumbing system. The TDH is the measurement of resistance working against your pump as it pulls water from your pool and then pushes it through your filter and back to your pool. The higher the dynamic head the larger the pump and pipe you will need to offset the pressure. The rise of the water. Pool equipment, i.e. filters, heaters, eyeballs. Keep in mind that the plumbing will determine your maximum flow rate. For each 1.5” intake line, the maximum flow rate is 51 GPM. Each 2” intake line can handle up to 84 GPM. We’re finally to the point where we can use the gallons, turnover rate & feet of head to select the HP of the pool pump. Each pump will have a correlating pump curve. This pump curve will point to the correct HP. This chart is easy to use. The feet of head is listed along the y-axis and the gallons per minute is listed along the x-axis. The point at which the two lines intersect will correspond with a particular HP. If it falls between two different HP lines, go with the higher of the two. Otherwise, the pump will not be strong enough for your turnover rate. 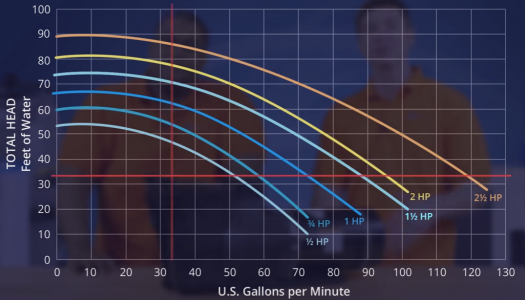 In our example, the 48 GPM line and 60’ of head line meet right below the 1.5HP curve. So the 1.5HP pump work for our example. Now, this pump curve pointed to 1.5HP, but the HP will vary from model to model so make sure you look at the pump curve of each one. Should I Single, Dual, or Variable Speed Pool Pump? 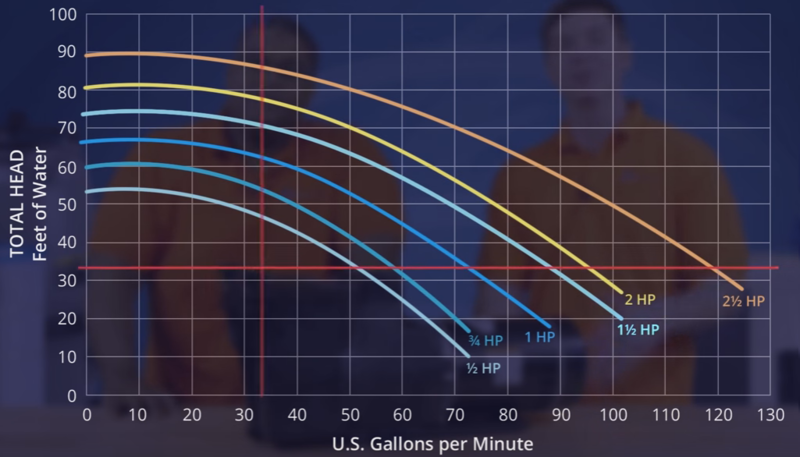 We’d like to say that once you’ve found the correct HP for your pump that you’d be done but lets pump the brakes a little bit. There are still three different types of pumps to choose from. You have the single speed, dual speed, and variable speed pumps. Let’s start with a basic overview of each type. The most common type is the single speed pump. This pump operates at a single speed of 3450 revolutions per minute (RPM). This kind of pump has the lowest upfront cost but the highest operational costs. Next up is the dual speed pump. This pump operates at two speeds; 3450 RPM and 1750 RPM. This pump has a more expensive up front cost but it can also save you up to 50% on operational costs over the single speed pump. This is due to the pump pulling lower amps when it’s in the low speed. Another benefit to running it on low speed is that it is very quiet. Finally, we have the variable speed pump. This pump can operate at a full range of speeds from 600 RPM to 3450 RPM. It has the most upfront cost but it is by far the least expensive pump to operate. This pump is great for situations where you have water features or an attached spa. You can run the pump at a low RPM to circulate the water, then kick it up a little bit to run a waterfall and then kick it all the way up to a higher RPM to run the message jets in the spa. For more information regarding the differences between these pumps check out our blog. Stay tuned for Part 2 of Inyo’s Inground Pool Equipment Selection Series, Filters. Does pumping the pool water to solar heating on a one story home have a rating impact? When the pump has to prime the solar panels, for every foot of rise a foot of head is added to your calculation. So if your panels are 10 feet above your pump, then that is 10 feet added to your head. Thanks for the info. I still have questions but maybe the booklet will help. You can always give us a call at 407-834-2200. Is there any way to determine head-height? 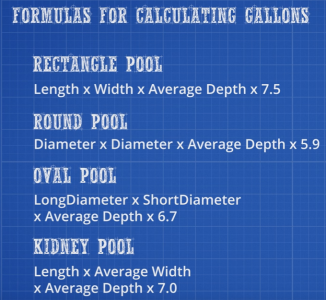 We have this article: How Do I Calculate Feet of Head for My Pool?